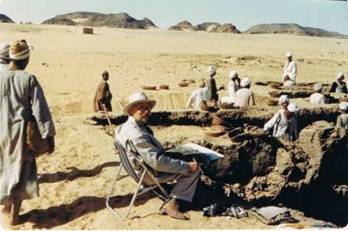 In 1962, Alan Sorrell travelled to Nubia to record the temples, villages and other archaeological sites before they were either flooded or moved. 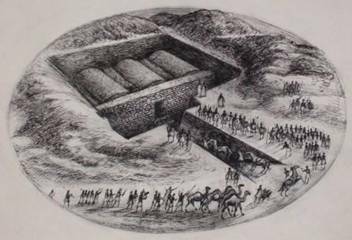 It became the worlds most famous archaeological rescue event of the century. Alan Sorrell came back with a total of 54 drawings with watercolour. Left you can see him at work recording the excavation of a Coptic house by the Pennsylvania and Yale Universities Expedition led by the ambitious young Professor Kelly Simpson (22-23rd February). 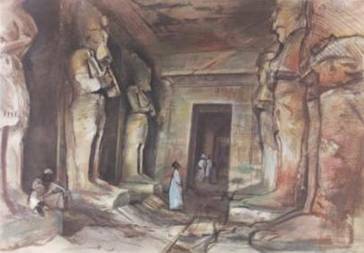 “These drawings of Nubia were made in February and March, 1962, having been commissioned by Sir Bruce Ingrams, Editor of the ‘Illustrated London News’, to record the monuments and localities which would be doomed to disappear with the completion of the new Aswan High Dam, the raising of the level of the Nile, and the transformation of the ancient land of Nubia into a vast artificial lake. An international archaeoloigical rescue operation ‘To Save the Monuments of Nubia’ under the direction of UNESCO in collaboration with the Government of the United Arab Republic, had achieved much success, and there had also been extensive photographic, photogrammetric and film recording of the Nubian scene, but this is the only collection of drawings giving a human appreciation (as opposed to a mechanical one) which exists. 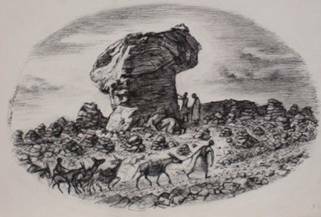 In the nineteenth century, David Roberts and Edward Lear made some beautiful drawings of Nubia, but neither of these artists attempted anything in the nature of a comprehensive record. The Government of the United Arab Republic gave generous encouragement to the project, and the H.E. Dr Sarwat Okasha, Minister of Culture, put this encouragement into positive form by placing at my disposal the 84-foot launch ‘Sheik el Beled’, with its crew of ten, and a guide/interpreter Mr Abdin Siam, Inspector of Nubian Antiquaries. I travelled to Abu Simbel from Aswan in the Sheik el Beled’, which then returned to Aswan whilst I stayed at Abu Simbel on board the houseboat ‘Hathor’, the Government Documentation Centre. There were trips to Armenna and Toshka, Abu Oda and Ballana, and to Wadi Halfa, Semna and Buhen in the Sudan, where Professor W.B.Emery, who had earlier given valuable help, gave hospitality too. 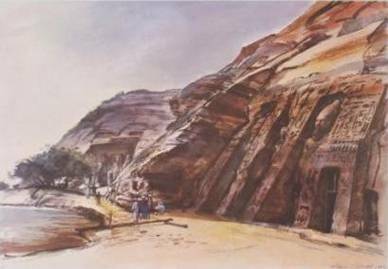 During the return journey from Abu Simbel to Aswan in the ‘Sheik el Beled’ many drawings were made, some of them at places normally inaccessible to visitors. The ‘Illustrated London News’ published a selection of the drawings from June to August 1962, and the complete collection was shown in London at the reception by H.E. Mohamed el Kony, Ambassador of the United Arab Republic. Many of the drawings were published by Longmans Young Books Ltd in 1969, under the title of ‘Nubia; A Drowning Land’, with an accompanying text by Margaret S. Drower. The collection was purchased in 1968 by Mr F.D. 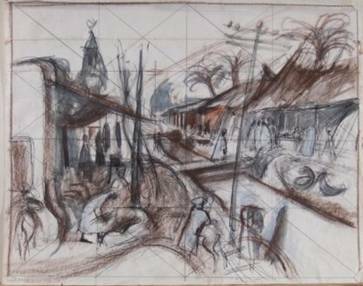 Todman and through his generosity is now on long term loan to the Beecroft Art Gallery, Southend-on-Sea”. 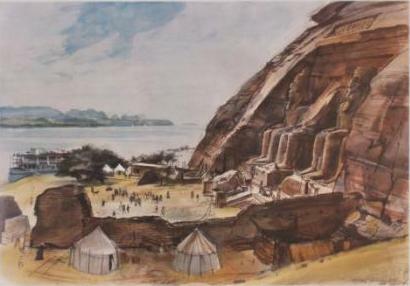 As well as the monuments, Alan Sorrell was deeply concerned about the plight of the 120,000 Nubians, a people who had with inhabited this land for many millennia, and whose way of life and unique culture was about to be destroyed. 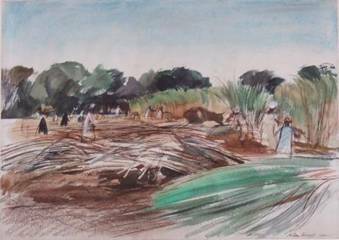 Right, we see the Nubians at work harvesting the sugar cane. Below a working sketch of a street scene. 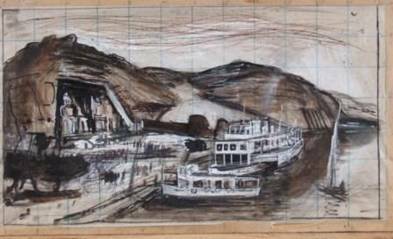 After his return from Nubia, Alan Sorrell also completed several more paintings based on his Nubian experience: Right is a working drawing for a large oil showing the Abu Simbel scene, with his launch the ‘Sheik el Beled’ in the foreground, and behind the Presidential Steamboat ‘The Rameses II’ which was being used to visiting dignitaries the sites of Nubia. 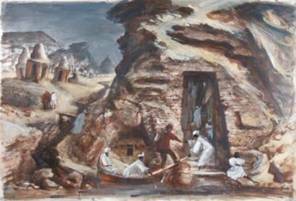 ‘The Artist Discovering a Rock Cut Tomb’.